These braised lamb shanks have tender, fall-off-the-bone meat. They're coated in a rich sauce made with red wine, crushed tomatoes, and stew vegetables. Low carb, keto, and gluten free. Pat lamb shanks dry with paper towels. Generously season all sides with salt and pepper. Add olive oil to a 6-quart dutch oven or wide heavy pot over medium heat. Add butter and stir to coat the bottom of the pot until melted. Add shanks to the pot in a single layer and cook for about 5 minutes until the bottom is nicely browned. Flip and repeat with the other side for about 4 minutes. Transfer the shanks to a large bowl. Add carrots, celery, onions, and garlic to the pot. Cook until softened, a few minutes, stirring occasionally. Carefully add red wine, and loosen any brown bits stuck to the bottom of the pot. Add water, crushed tomatoes with liquid, peas, and cocoa powder, stirring them in. Return the lamb shanks to the pot in a single layer. Increase heat and bring to a gentle boil. Cover and reduce heat to medium-low. Simmer until the meat is very tender and easily falls off the bone, about 2 1/2 hours. Uncover and transfer only the shanks to serving dishes. Tent with foil to keep them warm. Increase heat to medium and boil the liquid in the pot until thickened to a sauce-like consistency, about 15 minutes, stirring frequently. Turn off the heat, skim off fat if desired, and pour the sauce over lamb shanks. Top with parsley, and serve while warm with sides like mashed cauliflower. 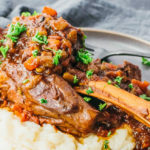 This recipe yields 9.5 g net carbs per serving (1 lamb shank or half of the recipe).